What appears to be a wing flap washed ashore on La Reunion island this morning. A source familiar with the investigation into the disappearance of Malaysia Airlines Flight 370 tells ABC News the airplane part that washed ashore on La Reunión Island, a small French isle near Madagascar, appears to be from a Boeing 777. MH370, the Malaysia Airlines plane that disappeared over the Indian Ocean 508 days ago, was also a Boeing 777. If connected to the downed plane, the part –- which experts tell ABC News appears to be a wing flap about 2 meters long and 1 meter wide -– could be the first piece of MH370 debris recovered to date. A team working to clean the beach stumbled on the apparent wing flap around 9:30 local time Wednesday morning. In a statement, the Australian government said that it was aware of the "wreckage" and was working to determine its origin. "In the event that the wreckage is identified as being from MH 370 on La Reunion Island, it would be consistent with other analysis and modelling that the resting place of the aircraft is in the southern Indian Ocean," Deputy Prime Minister Warren Truss said in a statement. Malaysia Airlines said it was "working with the relevant authorities" but "at the moment, it would be too premature to speculate on the origin of the flaperon." 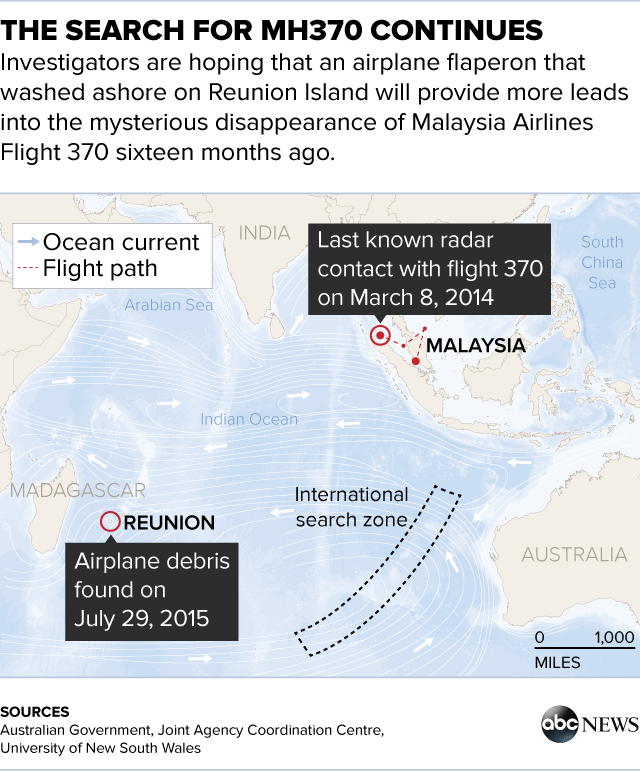 Since the plane's disappearance in March 2014, Australia, Malaysia, the U.S. and other countries have spent tens of millions of dollars combing the sea for the missing jet. "It’s unlikely today’s discovery will lead investigators to the submerged wreckage," former NTSB aviation safety official Tom Haueter tells ABC News. "It’s had over a year to drift around." According to Haueter, a consultant for ABC News, investigators probably tried to match serial numbers on the part to those on MH370, a Boeing 777. “If it is a 777 part, it’s most likely from MH370,” Haueter told ABC.